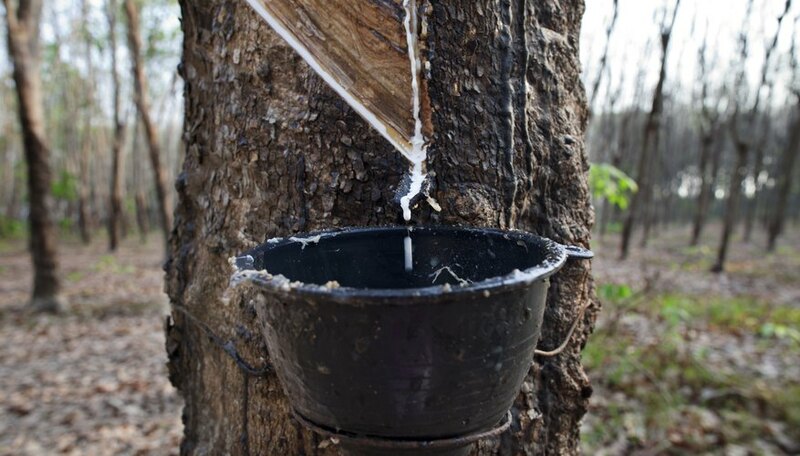 Natural rubber occurs in the extracted sap, or latex, of a rubber tree. The Para rubber tree, Hevea brasiliensis, is the most economically important latex source. Latex is present in tube-like vessels within the soft inner bark of this tree. There is no latex within the tree’s wood or in its outer bark. Hevea grows to a height of over 140 feet. The tree is vulnerable to frost as low temperatures make its rubber brittle. Hevea is native to the Amazon rainforest where it grew exclusively until the late 19th century. In 1875, British planter Henry Wickham smuggled the tree’s seeds from Brazil to Kew Gardens, London where they germinated into seedlings. British planters took the seedlings to colonial plantations in Ceylon (Sri Lanka) and Singapore where they developed the rubber tapping process. The Brazilian and Peruvian rubber industries could not compete with East Asian products and collapsed, except for family smallholdings. Southeast Asia now accounts for 95 percent of the world’s rubber supply. The rubber tapper begins by making an oblique incision into the tree and shaving off a thin sliver of bark. The cut severs the latex vessels, allowing the latex to flow down the cut in the bark. It collects in a cup attached to the tree beneath the cut. Flow ceases after a few hours as the latex coagulates at the bottom of the severed vessels. The tapper repeats the process every two or three days, progressively moving the cut down the tree trunk. Certain varieties of rubber trees, such as the Guayule shrub, contain rubber within the tree’s stem. Rubber extraction involves cutting down the tree and grinding the wood. The advantage of tapping latex is that it preserves the tree for future rubber production as well as rainforest conservation. The Hevea tree has a growth lifetime of up to 30 years and an economic (latex production) lifetime of up to 25 years. It continues to grow throughout the tapping process and produces new latex to recharge its vessels. As a result, the tree’s economic advantage is that it yields more rubber during one year of tapping than its total rubber content at any one time. What Is This Sticky Goo on the Evergreen Tree? What Are the Five Main Parts of a Tree Trunk Called?